When I was a classroom teacher, my kids published a lot of books. We carefully finished our pages and then used the plastic spiral binder in the teachers' room to bind the pages into book form. We would put them on display in the classroom or in the library. Publishing was important. It gave me the opportunity to take the moral high ground and ask the kids to do their very best because their writing was headed for publication. We all know that real audiences make a difference. And you've probably seen this when a classroom assignment goes from being something that only the teacher will see to something peers and the whole school will see. Effort and results go up. But publishing a book doesn't only bring the best out of our students. For more than two years, I had been carrying an idea for a book in my mind and in my heart. I had the text mostly written but needed an illustrator and a publisher. I finally opened my eyes and found the illustrator living right here with me -- my wife. Now, all I needed was a publisher. This is when I remembered talking with people who had self-published their books online through a Web site called Lulu. Two of those folks, David Warlick and Doug Johnson, I highly respect for their thinking on the effective and innovative use of technology to support schools, students, teachers, and their communities. So it was now time to get this thing done. I got serious about cleaning up the text, and my wife got serious about doing the illustrations. First, I created my account on Lulu. As a frugal Yankee, I appreciated the fact everything was free and that I would have to pay only if I ordered hard copies of my book. I read forums on the Web site about what works and installed NeoOffice on my MacBook. When the text and images were ready, I put them together in a NeoOffice document and exported it as a PDF file. Of course, I had to spend a bit of time figuring out how the numbering of pages works, where to put the title page, and other things a real publisher would have done for me. But I was learning, and the sense of empowerment when I uploaded the finished document was palpable -- I had done it! Next, I used the supplied templates to create a cover. I inserted a photo of my wife and me on the back and a picture of a California gray whale fluking off the coast of Oregon for the front, along with the title. With the cover uploaded, the project was complete. I was tempted at this point to put a link on my Web site and order a bunch of the books to sell at conferences. But Lulu has obviously worked with many rookies, and the site warned me to begin by ordering only one hard copy to make sure it really was the book I had carried in my mind and heart for so long. I listened to the site's counsel, ordered one, and waited impatiently for a week or so. When it came, I read it, achieved a new level of humility, and set about fixing the multiple mistakes I found. Trust me, I have a new respect for editing. Yeah, I've edited stuff before, but this was our book. I made the changes, uploaded the updated files, and ordered another hard copy. That came, and I found one last flaw. I then uploaded one more set of updates and called it finished. But I still worried, just like a student. When the audience is real, the quality matters so much more. So, there you go. 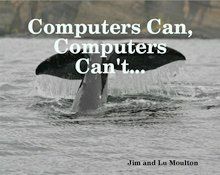 Our published book is called Computers Can, Computers Can't. Ever since I used the Lulu Web site to create our book, I have been actively encouraging teachers to publish their books. I'm interested to find out how many educators there are out there like David, Doug, my wife, and me. Have you used Lulu or any other self-publishing utility to put your kids' work into a book? Are you an elementary school teacher who took that ABC book to a new level or a social studies teacher who has made oral histories of local old-timers part of the community collection of text in the school and local libraries? What about doing Anytown Middle School: Our Writing, 2009 and including in it one piece from each student? And, of course, when you publish online, you can make your book available to anyone, or you can restrict access. So, how about creating a book with your class and sharing it with a class across town, across the state, across the nation, or across the globe? The bottom line is, you can do so much. The only limit will be your creativity. Remember, if you've self-published with your students, please share. I'd love to know what folks are doing and, as always, what you think are the best technology tools out there.